This post has been brewing for some time now, but I have not had the brain power to write it. I am asking you to take five minutes (or longer, depending on how turbulent the brain fog is today) to read. After seeing this Facebook post by a fellow Melbournian woman, I knew that I had to push past my own personal issues and write; that this was the time. I remember the exact moment where my Gastroenterologist used myself and Disabled in the same sentence. There wasn’t a breath, there most certainly wasn’t a pause. Please, allow me to absorb what you have just said before you keep talking Gastroenterological language. It sounded a bit like “Blah blah blah, now that you are disabled we should apply for the Disability Pension, blah blah blah”. Maybe it was my inability to accept that I was Chronically Ill, or maybe it was purely the naivety in me (which heavily consumes most of society), but at that very moment I did not want to believe that, nor could I understand how, I now defined as Disabled. What is the first image that pops into your mind when you think of the word Disabled? because this is the image that defines a Disability worldwide. It is plastered at every Shopping Centre Parking Bay, every toilet, it is on the permit of every car with a Disabled passenger or driver, and it is in every Government centre or office, every hospital, every Doctor’s Clinic. I do not require a wheelchair, but this is the picture that I am bound to; this is the picture that now defines me. The term Disabled being outlined as, “having a physical or mental condition that limits ones movement, sense, or activities“. In the definition it is clearly stated that not only can the condition be physical or mental, but that it limits ones movement, sense or activities. you have chosen an image that shelters sufferers of VISIBLE Disabilities, ie. special needs, those who use a wheelchair, walker or crutches as transport. You are feeding the wrong message to society, or maybe it is in fact that your message needs an update. You have separated sufferers and put us on scales of which Disease or Disability outshines the other, and apparently in order to qualify as Disabled, society believes that I have to physically look SICK and IMMOBILE. You have put some of our heads as targets to be subjected to bullying. 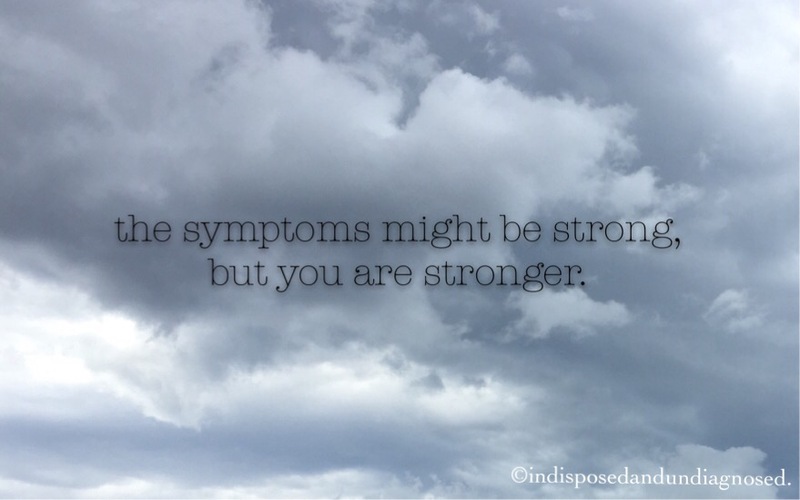 Our illnesses and personal struggles are questioned, mimicked and misunderstood. People walk down the street and see a person from crutches emerging from their car in a Disabled Permit Zone, and they think “oh, they’re Disabled”. But what about sufferers like Justine? She parks her car in a Disabled Permit Zone (with a permit), tries to go about her day as normally as possible, and receives judgement from strangers behind a pen and notepaper. What about the rest of the population suffering from illnesses that cannot be seen, and whom qualify for a Disability Pension or Permit to display? What about the Cancer patient who has not lost their hair? The MS patient who still has minimal mobility? The sufferers of Fibromyalgia, POTS, Chronic Fatigue, Depression and Anxiety with symptoms that cannot be SEEN? Or how about me, one of many sufferers of Gastroparesis? You cannot SEE my Nausea (unless I am vomiting). You cannot see the Chronic Pain, Dizziness or Fatigue that accompanies my disease and confines me from partaking in a fulltime job or travelling independently. I am sure that most of your symptoms also go unseen. We suffer silently or invisibly. Society has been educated to assume that the ill, must look ill; that our exterior must match that of the Disability Symbol. It is POSSIBLE for an illness to have stricken a body that is still very mobile and appears to relatively “normal” on the outside – a body that is young or old. It is POSSIBLE to be chronically ill, but have days where you are feeling well enough to experience your day “normally”. We might be able to walk on some days, you might see us exercising, you might see us driving. This does NOT mean that we are not Disabled – it means that we are having a good day of health, and there is NO SHAME in that. Please, do not take this post as an intention for me to discourage others. I AM Disabled, but I am one of many who are tired of being judged based on my appearance and its relation to this symbol. I am tired of having to explain myself and be compared to the world’s accepted view of a Disability. The Government doesn’t just willingly hand out Disability Pensions to everyone that applies. We go through a gruelling application process, a handful of rejections, appointments, interviews, phone calls and not to mention, we are suffering enough day to day with our symptoms. We don’t want the pension, we NEED it. We would choose health every day, if it were possible. We don’t want to be like this. I know myself, being twenty-three, I should be enjoying my life and instead I am stuck at appointments and fighting for a Government income to help pay for these appointments. A Disability is a Disability. There should be no further questions, right? But there ARE and that is why I am suggesting a change altogether. The Disability symbol itself needs to be altered to something more accepting of all circumstances, or there needs to be a complete reinvent of a symbol for those suffering with Illnesses with symptoms that are not visible. Think of words that describe us, but do not limit us to the image of a wheelchair? Maybe we do not fall under the atypical “Disabled” category, and need a category of our own? Perhaps a letter such a H (for Handicapped as it is a much more unified word), or I (for Illness) should be used on a sign as opposed or alongside the current one? If you are reading this and can admit that you are one of the judgemental people above – the ones who wrongfully assume that in order to be Disabled, you must be in a wheelchair or visibly impaired – then you really need to make a change. Please think before you do something as pitiful and hurtful as above, based on another’s appearance. How is it fair to bully, when you are unaware of one’s circumstances? I can assure you that you would not like it if it were you, or a loved one being treated this way whilst being ill. So, what makes you think that we enjoy events like this one? It’s plain and simple, just don’t do it. At the end of the day, this post won’t stop you from passing judgement and neither will the symbol. But just let it be known that we (those suffering with Invisible and Chronic Illnesses) have braved more than your words and cruelty. You might not think there are many of us, but we come in numbers, and we are stronger than your view of us.